One 46 Gal. Glutton® Container. Two 23 Gal. Slim Jim® Liners. One Symbol/Word Label Pack in English, French & Spanish. Choose from a selection of restrictive-opening hole shapes and iconic symbol word labels to suit your particular recycling program. The color coded iconic labels and various shaped restrictive-opening holes provide visual cues for material identification to minimize contamination. All plastic corrosion resistant construction withstands impacts, and has a low risk of scratching floors or snapping carpets. Blue stations are made with post consumer resin (PCR), meet or exceed EPA recommendations for PCR content, and count toward LEED® credit and government procurement requirements. Support your facility's recycling program, help reduce labor costs, and improve worker well-being with these commercial plastic Glutton® Recycle Stations. This high-capacity, all-in-one centralized solution provides flexible configurations for efficient, cost-effective waste sortation. 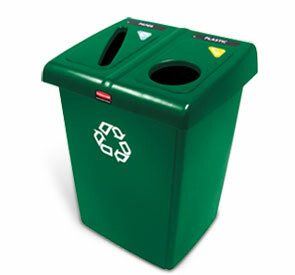 Available in a two stream 46 gallon capacity or four stream 92 gallon capacity, these recycling stations feature restrictive-opening hole locations, and inclined lids designed to minimize waste splashes on back walls. Two 46 Gal. Glutton® Container. Four 23 Gal. Slim Jim® Liners. 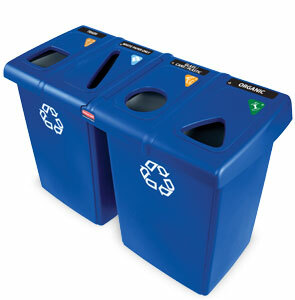 These fully integrated stations give credibility to building recycling programs and drives recycling compliance. Both two and four stream stations are available in Dark Green, Blue, and Beige, and feature rounded lid edges to discourage placement of other objects on top of the units.